I count on my friends. Do those comments ring true for you? If so, consider yourself blessed. My mother certainly was. She lived almost her entire life in Cincinnati and maintained friendships that started as far back as grade school. But she kept making friends until her death at 90 in a retirement community. She made friends from volunteering, joining a health club, signing up for a golf league and joining a church. And she made friends with people of all ages. While she never used the word “intergenerational,” that’s what she practiced. She became friends with many of the children of her peers, and those friendships grew after the death of my father and her lifelong friends. Younger friends make life interesting, she often told me. My mother outlived most of her friends, and I often think how lonely she would have been if she had not kept making friends, especially younger ones, throughout her life. Friends play an important role throughout our life, and that includes old age. A recent study led by William Chopik, an assistant professor of psychology at Michigan State University, compared surveys of approximately 280,000 young and old adults. “Older participants identified only their friendships as reliably strong predictors of how happy and healthy they felt,” according to an article published in AARP. Another study, this one at the University of California in San Francisco, studied 1,600 men and women, with an average age of 71. “Those who reported loneliness were more likely to develop difficulties with activities of daily living. Even when the study controlled for socioeconomic status and health, the lonely had higher mortality: Nearly 23 percent died within six years, compared with 14 percent of those who weren’t lonely,” Paula Span writes in The New York Times. Regardless of age, good friends are good for your health, according to Mayo Clinic. “Adults with strong social support have a reduced risk of many significant health problems, including depression, high blood pressure and an unhealthy body mass index (BMI). Studies have even found that older adults with a rich social life are likely to live longer than their peers with fewer connections,” Mayo Clinic explains. Encouragement to avoid or change unhealthy habits. Old friends are often like family to us. They knew our parents and siblings and were there for our first cars, boyfriends, breakups and the like. We made more friends in college and workplaces, then moved away and kept in touch with visits, phone calls and letters, now emails. Hopefully we continue making friends, because it’s best viewed as a lifelong pursuit. But how do we make friends in our older years? Let’s start with volunteering, which is also good for your health. Try to find a volunteer project that involves an activity you already enjoy or one you are interested in discovering. My mother loved reading, so she found an agency that needed tutors for homeless children. Volunteer opportunities abound in your neighborhood. Just ask the schools, library, parks, churches, hospitals, animal shelters and other nonprofits for ideas. Or check out VolunteerMatch.org, where you can match your location and interest. Another way to meet new friends is to sign up for a class or program. Many colleges offer free or nominally priced audit-only courses for older adults, and community colleges offer non-credit courses for adults 50 and older. Also, explore programs at the library, arts center, health club or dance studio. Making friends with younger people is easier than you think. I babysat for a family who lived just behind our house. My mother got to know the mother, about 15 years younger, and they became friends. The two women eventually joined a book club and remained friends until her death. My mother became friends with one of my former co-workers, my sister-in-law’s sister, and countless children of her childhood friends. Intergenerational friendships offer lots of rewards, she discovered. Improved physical health: You burn more calories, experience fewer falls and are less reliant on canes. Improved mental health: You perform better on memory tests, and those with dementia experience more positive effects than in non-intergenerational activities. Improved emotional health: Feelings of isolation and depression decrease and self-worth and happiness increase. For children, their self-esteem and behavior improve when they interact with older adults. Volunteer opportunities are a great way to meet younger friends. Mentoring and tutoring programs, and church and day camps are always looking for a helping hand from older adults. 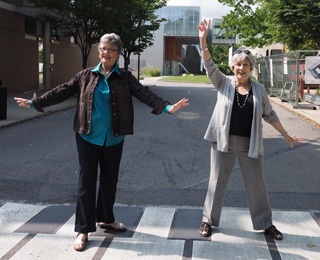 Residents at Kendal at Oberlin don’t have to look far to find an intergenerational activity. The life plan community is home to the Kendal Early Learning Center for preschool children. Residents read and help with other activities in the classroom and plan special events throughout the campus that involve food and fun. Oberlin College also provides many intergenerational opportunities, both in and out of the classroom. When Polly and Al Carroll moved to Kendal at Oberlin in 2003, they were excited to meet international students. The couple lived in England for 2 ½ years and appreciated all the hospitality Brits extended to them, and they want to do the same for students far from home. Some of the couple’s activities have included driving a student to a store to buy her first winter coat, providing food for a student’s senior recital, taking a student to her first zoo, and attending a student’s rugby game. And, of course, food is often involved. Polly likes to cook meals, especially a Chinese, Thai or other dish from a student’s native country, or they all eat together at the Kendal dining room or in a restaurant. “Students are always hungry,” Polly says. Living at a continuing care retirement community like Kendal makes building friendships easy. Kendal has more than 100 committees and a full and diverse events calendar. Residents get to know each other while swimming or dining, walking, working on the jigsaw puzzle in the lobby or attending a concert. Residents are as busy as they want and can be as social as they desire, and this is true of all residents, whether living in cottages, apartments or in the community’s assisted living and nursing care suites. And let’s not forget about our four-legged friends. Many residents have pets, and often walk around campus with their leashed dogs or play with the animals in their yard or pet park. For animal-lover residents who don’t have their own pet, living in a community with cats and dogs is like having a surrogate best friend – and a healthy one, too. Find out how easy it is to make friends at Kendal at Oberlin by contacting us online or calling 800-548-9469 or 440-775-0094.